Mercury - In Air -Libra, Triplicity lord of the Night: The Wing messenger; On the Wings of an Eagle I fly. He will bring together the union and cooperation of justice. The reasonableness of thought. However, yes there's always a however! What you thought you had negotiated will be held-up. Detail and maybe changes in those plans. Around September 14th 2015, Mercury will make contact with a sluggish Lady ! - Venus will now be moving direct, but very slow -and then Mercury will Station retrograde. Ah just when you thought it was all going to plan!!! Eclipse -Eclipse, Solar and Lunar, my, my on September 13th, the day before mentioned, a partial total solar eclipse at 20 degrees Virgo. This astrological numbered - 18 North Saros 125, new Moon eclipse will trigger many thorny Cerebral psychological issues, don't worry be happy may seem a long way off!! The Mental mind will be on a merry-go-round, don't hold on to tight. Sept, 19th, a week before lunar full moon eclipse on Sept 28th, Saturn enters Sagittarius. This entry will be somewhat dampened, as Mars enters Virgo on Sept 25th. This ingress by Mars will trigger a difficult square to Saturn which will linger up until the Lunar eclipse. Then with the Fireworks done and dusted you clean up the rubbish leftover. Well sort off, the following weeks will see Mars meet Jupiter and Venus square Saturn. Oh that's the Greek theatre for the next month or so. Buy your tickets now, as the crowds will gather and the queue &; cues' will get longer, and you don't want miss this epic long play. Or do you? Jupiter in Virgo - Jupiter's time in the image of Lion/Leo is coming to an end. @ 21:11hrs (9:11pm) AEST -10, Sydney, Australia, 11 August 2015, Jupiter will ingress into the image of the Virgin/Virgo. This ingress will be of great significants for the divine Goddess of harvest. Already we see the first plants grown and eaten in space. Some 365kms above the earth Astronauts Scott Kelly, Kjell Lindgren, and Kimiya Yui all munched on red romaine lettuce yesterday afternoon, this produce was grown on the International Space Station. It was the first time people have eaten food cultivated in space. Jupiter's ingress will be witnessed by the royal watcher of the North. A powerful forceful and dynamic triple star. Places of worship around the globe, no matter the faith, will be venerated. Like a procession military tribunal, those who have committed unvirtuous acts will be Justly dealt with. Church and state. Attention to detail. While some may suggest, not to get overly fussed with detail. For me, who has a Mercury/Jupiter partile conjunction in Virgo, it's hard not to. I have one phase for Jupiter in Virgo - Mundane to the Divine. Add Mercury and you sacred, secrete Celestial angelic knowledge transmitted. On August 3rd & 4th, 2015, in the early dawn sky, Mars the planet associated with wild, reckless & untamed energy, ( until given spiritual guidance), will make his first helical rise (15 degrees from the Sun) for the year. The planet's first appearance "proper" in this new contra Sect phase, will have many varied influences, depended upon the global positioning of the country. An example is seen here in Sydney, Australia, Mars will make its first exterior rise ahead of the Sun on August 4th. This helical appearance will also carry many interesting nuances. Mars will commence this new phase (26 degrees Cancer) on what is known as a Tropical Cardinal Lunar Station. These stations, (13 degrees apart - commencing from 00:00 Aries - Cancers - Libra and Capricorn,) accentuate the energy. Adding to this wild energy release, helical rise, new phase, will be the witnessing by the confine lord, Saturn and the southern enigmatic lead star Procyon, (a star of some unknowable, mysterious association, found in the constellation Canis Minor) the star, when link to Mars, has a wild canine correlation. Transiting Saturn has just stationed direct, and is in the late degrees of the Scorpion. The transiting Moon is in the late degrees of Pisces in the confines of Mars. 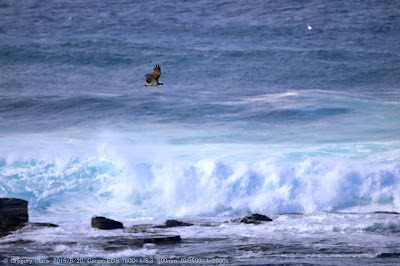 Suggesting a powerful wild, undomesticated & feral watery release of energy awaits its formation & design. Furthermore this enigmatic force will also be carrying the weight of the ripe, full moon. With all due respect; On July 29th, 2015, @ the reported time of 09:04hrs, Reunion Island, La Digue, Seychelles, Saint Andre, USZ3-04:00hrs, "Johnny Begue, the gardener who stumbled across the Boeing 777 debris on the beach, has been chatting to reporters who have just arrived on Reunion Island. He said he toyed with the idea of using the debris as a decoration, but decided against it out of respect for the victims' families. The present Venus Station RX is also very interesting. 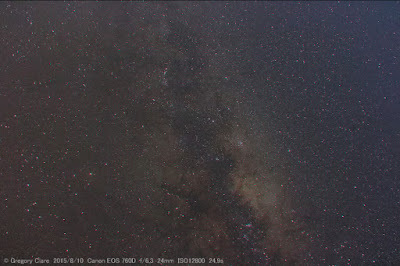 As posted on FB, July 17th, 2015, Venus unites: And the Saturn Station direct. 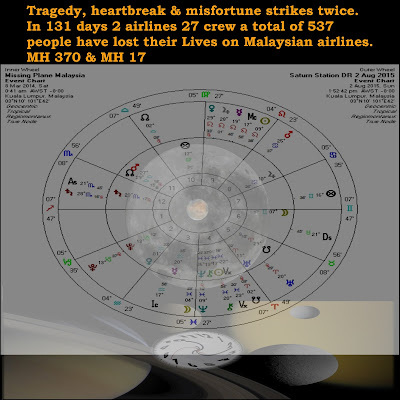 The event chart for the departure of MH-370; (00:41am, KL) - Ascendant, Sagittarius 07 degrees rising, Lord of Sag is exalted Jupiter, placed in the 8th house, (loss & death - Exalted - blown up and enlarged) Regiomontanus 05, Cancer house cusp. Jupiter is the traditional lord of Pisces, along with the modern assigned steward, Neptune. Pisces is the 4th house sign, and IC, and Neptune is conjoined to it. The house also contains the Sun/Vertex, opposition to the Lot of Fortune. (physical fortune comes from the Sun position + arc, projected from the ascendant, - minus the Moon arc. The dispositor of Jupiter is the Moon, (ruler of Cancer), placed in Gemini upon the setting pivot, and 12th house from the 8th. Signifying the type of death or loss. The Moon is also co ruler of possessions - Collector) These two statements are important to include. The second house is, (possessions - moveable objects - plane) Lord of Capricorn is Saturn, placed in his house of Joy, the 12th, and retrograde, contra to Sect. (Nocturnal chart). Third and Ninth are the travel houses, dependent upon the type of journey, adding to this is the Moon, who is multi co-representative, symbolic figure. 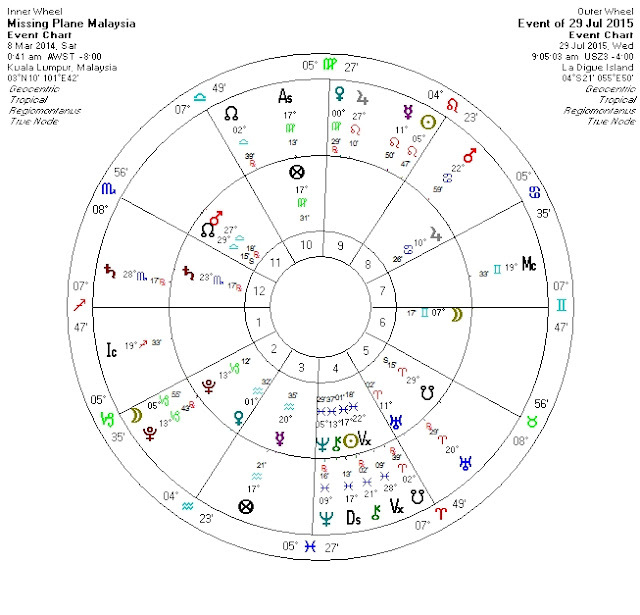 Mercury in the third applying square to Saturn, trine Mars, and lord of the event, MC. Finally look at the transit chart for the announced time, 09:00am, and the rx chart of Mercury. 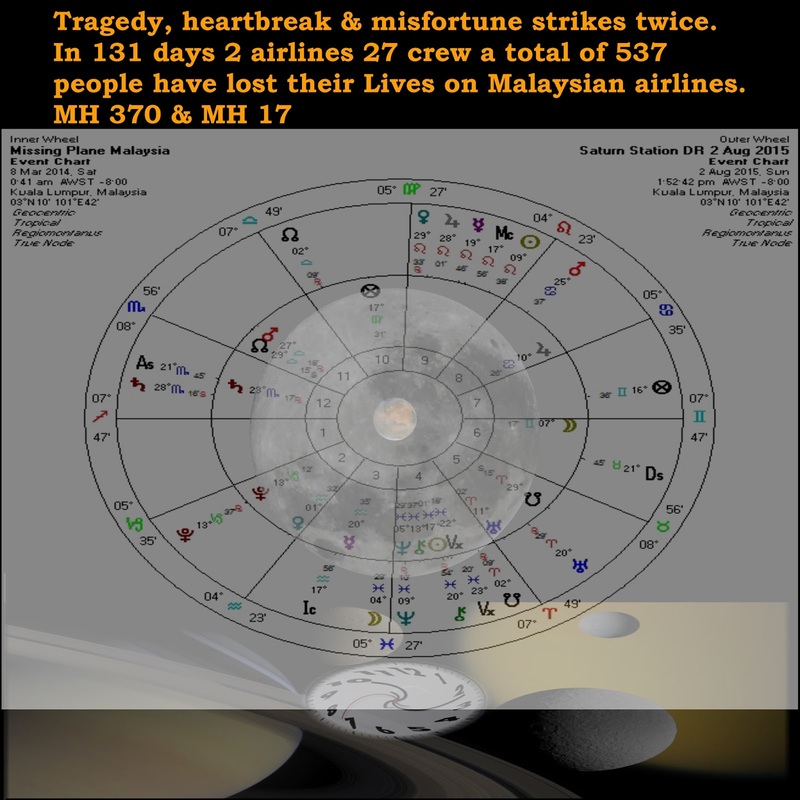 In addition to compelling charts are the current and next lunar return charts for the Event, 8th March, 2014. 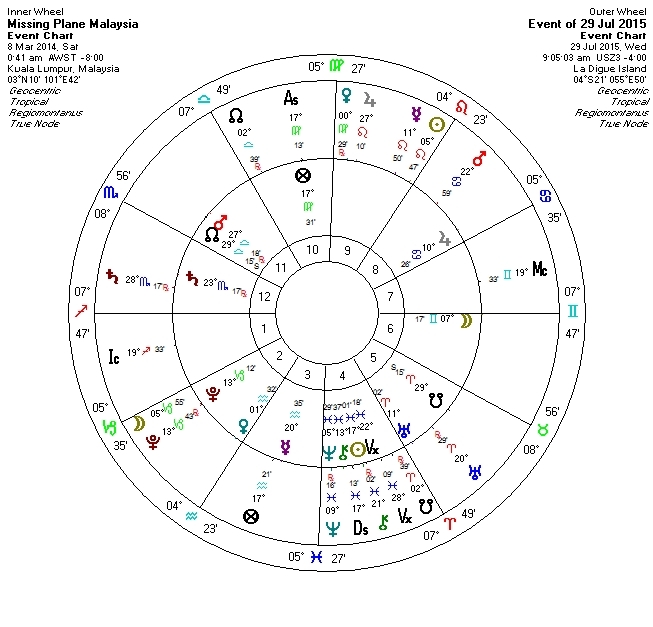 And last look at the Mars helical rise chart for the 3rd and 4th August, 2015, Mars at 15 degrees separation from the Sun, set for KL.